Those kind of comments usually elicit a weary sigh and a response that I call “D3 on the juke box,” as I explain the Health at Every Size® perspective and that the war on obesity is causing more harm than good. But the personal perspective of my former patient’s note struck a different chord in me. I felt angry and sad on her behalf and it elicited a flurry of questions. How do we hold on to the benefits of adopting a HAES approach if loving yourself continues to be undermined everywhere you go? How do we strengthen our commitment to finding our healthy weight when the criticism we receive about how we look activates the urge to sign up for a diet program offering pre-packaged foods not fit for human consumption. Why do people keep insisting that even if we are healthy we still need to “just lose the weight” because we don’t fit the image of a healthy thin person? I LOVE THAT!!!! I want to make a cartoon of a clam lying on a therapist’s couch and the clam says, “I just have this horrible feeling that if I open up, I will DIE! !” 🙂 Where would we be without humor? Thanks also for your very sweet feedback about my writing. I really appreciate that! Thank you for your feedback and I love the term DietTribe!!! Warm wishes to you!! And I think we need a “leave everyone the hell alone” day. Reading your post brought back the shades of times when I would outwalk all my thinner friends without getting tired. And yet I was the one the doctor pushed to lose weight (according to him, I was still 13 pounds overweight at 5’9 and 153, with a large frame. I was 16. My “measurements,” as they called them then, were 38-28-38). Now, thinking of the idiocy and confusion inherent in his “good” intentions, I keep thinking how ridiculous his stipulations were, and how ridiculous such stipulations are when all well-intentioned doctors make them. How many women are sucked into hating their bodies? How many must develop a dysfunctional relationship with their bodies and themselves before the stupidity (and cupidity) of Big Diet and Big Pharma stop? Thank you for writing about it and questioning the blind unwavering wrongness that continues to be called “dieting/behavior modification/taking care of yourself/healthy behavior.” If enough of us keep questioning and showing in how many ways it is wrong, we will start to make a dent in the awfulness. And one day women will not have to worry about conforming to some very arbitrary standards of health and beauty. Well said and let’s keep saying it! Hugs back! 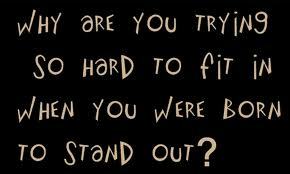 Having been a misfit all my life, this really resonated with me. And I think because of being a misfit, it made all that much easier for me to tell the diet industry to take a long walk off a very short pier into some very deep water when I finally found fat acceptance. I’ve come to look at my not “fitting in” as just a different way to shine, my way to shine, and that it’s not the same as everyone else is a good thing. Vesta, I so appreciate that you take the time and read each one of my blogs and always have an affirming perspective on the topic and how it has impacted you. Thank you! Of course you may share! Share away! I also have some wonderful resources on my website that you may want to check out. If you haven’t visited it yet it is drdeah.com Thanks for taking the time to write, it means a great deal to me. Deah – this is one of your best. I love the exploration of “fit”(ness? 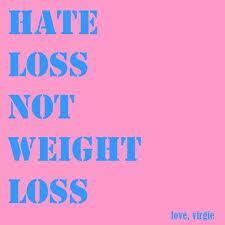 ), and the great way you finesse the substitution of “hate loss” for “weight loss.” Thanks. Thank YOU!! It really is an important topic. I just re-read an article from April of last year about two 8th grade girls who had a suicide pact because they were both chubby and were teased for being fat. 8th graders and they died because of NOT feeling like they fit in? Heart breaking. Great blog Deah!!! So true. We must be peaceful warriors to fight the fat fear and shine as our TRUTH. Thank you Julie! My hope is that we can get this message to the younger folks also, and perhaps they will be able to forgo this particular rite of passage!